I’m sure a few of you saw some stories last week that actor Kevin Smith is using an all-potato diet to lose some weight and improve his health. Kevin suffered a heart-health earlier this year and inspired by the success of Penn Jillette, who used potatoes to help him lose 100 pounds and get off many medications, he has joined us here on Team Tator! 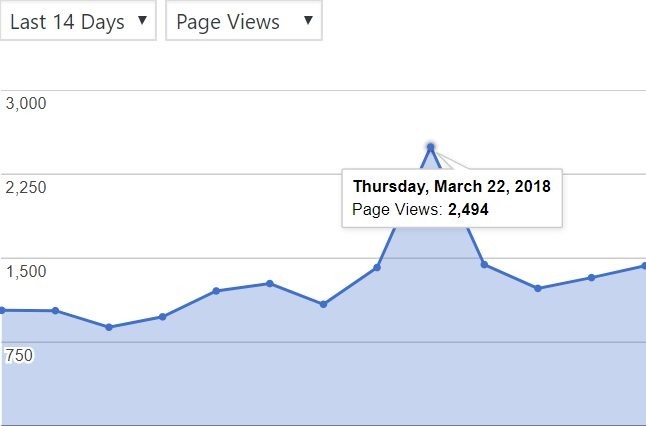 As you can see below, traffic to this blog spiked a bit last Thursday. All those extra page views went to Potato Hack related pages. Unfortunately, the search engines keep directing people to the worst two pages I have on the topic and not my best of Potato hack Diet page. I wish Kevin the best of luck in his recovery. He has a huge audience and many of them would benefit from swapping out a few meals each week for boiled potatoes. Silent Bob becomes Potato Bob. Always interesting to see the nutritionist comments in this type of article. Can you use as much good-quality natural butter with the potatoes. thinking of trying it out starting tomorrow April 2nd but really don’t like eating potatoes plain or lightly salted. @t. bondurant – I think you are missing the point. It is about removing flavor. No butter. Salt only if you must for the hack, otherwise, you won’t get the full benefits. Thanks for you quick reply. I guess I am not against an all potato diet but am trying to ask for a compromise. I understand the meditative reasons for eating potatoes plain, desensitizing yourself to “deliciousness”, but……….can’t I even use grass-fed full-o-healthy fats butter (or substitute per your recommendation)? ….on my knees begging btw. You are on Stage 3. Man up! @t. bondurant – One meal at a time. You can do it. Well…thanks again for the encouragement…but I decided to slightly compromise so I can at least get started. I figure it is better to start with something I enjoy, buttered potatoes, and (hopefully) switch to plain potatoes rather than start with plain potatoes and quit in a couple of days. Started today ate one giant potato very lightly buttered. I remember reading in the book “Siddhartha” by Herman Hesse that he said that one of his strengths is fasting because it gave him an advantage over people who couldn’t control their urges; might be an interesting read. Also what multivitamin brand do you suggest? Preferably without iron. @t. bondurant – I do not take vitamins.